pDsRed1-C1 encodes a novel red fluorescent protein (DsRed1; 1) that has been optimized for high expression in mammalian cells (excitation maximum = 558 nm; emission maximum = 583 nm.). Red fluorescent protein was originally isolated from an IndoPacific sea anemone relative, Discosoma sp.DsRed1’s coding sequence contains 144 silent base pair changes, which correspond to human codon-usage preferences for high expression in mammalian cells. A nucleotide sequence upstream of DsRed1 has been converted to a Kozak consensus translation initiation site to further increase the translation efficiency in eukaryotic cells. 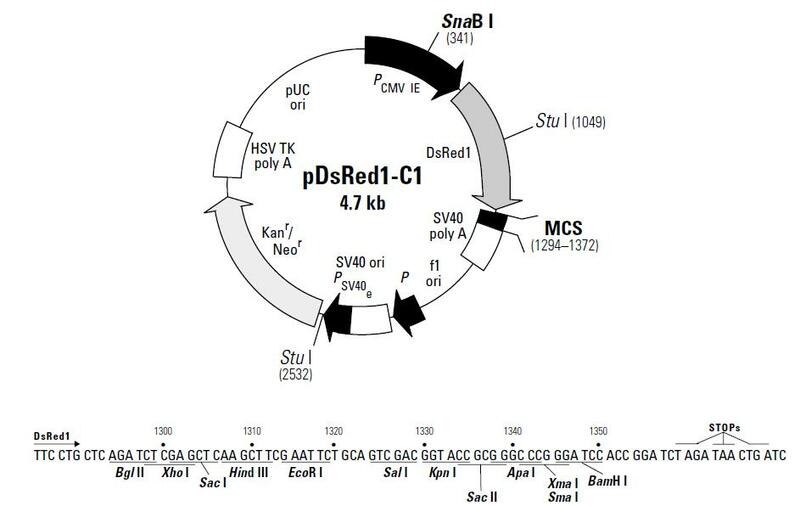 The multiple cloning site (MCS) in pDsRed1-C1 is positioned between the DsRed1 coding sequence and the SV40 polyadenylation signal (SV40 poly A). Genes cloned into the MCS will be expressed as fusions to the C-terminus of DsRed1 if they are in the same reading frame as DsRed1 and there are no intervening stop codons. SV40 poly A signals downstream of the MCS direct proper processing of the 3' end of mRNA transcripts. The vector backbone also contains an SV40 origin for replication in mammalian cells expressing the SV40 T-antigen. A neomycin resistance cassette (Neor), consisting of the SV40 early promoter, the neomycin/kanamycin resistance gene of Tn5, and polyadenylation signals from the Herpes simplex virus thymidine kinase (HSV TK) gene, allows stably transfected eukaryotic cells to be selected using G418. A bacterial promoter upstream of this cassette expresses kanamycin resistance in E. coli. The pDsRed1-C1 backbone also provides a pUC origin of replication for propagation in E. coli and an f1 origin for single-stranded DNA production.